Fresh from a change of direction which will mean an end to Nokia X, Asha and S60 devices, Microsoft has pulled a bit of a surprise with the announcement of a €19 ($25) device aimed squarely at first-time phone buyers across the world. 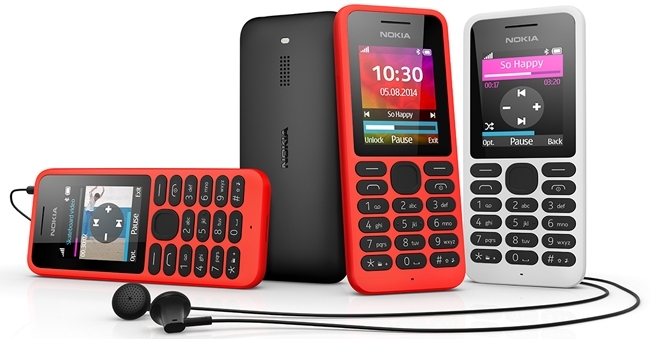 The company is putting all its smartphone efforts into the Windows Phone platform, but the new Nokia 130 bucks that trend since it is built on Nokia’s Series 30 software. Microsoft says the device is “the most affordable mobile phone with video and music player,” but it is certainly limited in its functions. The Nokia 130 sports an MP3 player, an FM radio and can play movies from an SD card because there’s no internet. The company claims the handset supports 46 hours of audio playback, and 16 hours of movie watching. The 1.8-inch phone also comes with a (basic) color display, a claimed 13 hours of talk time, and in single- or dual-SIM versions. Despite the less-than-impressive specs, the device is interesting because it appears to go against the focus on Windows Phone. That could be because the launch had been planned for some time by Nokia, but by letting this phone get released, Microsoft is hinting that it still has plans for the entry-level tier segment — where margins are low, but Nokia’s brand remains strong among consumers. Update: In an interview with Re/Code, Microsoft phone unit VP Jo Harlow says the company will retain Nokia’s entry-level phone business because “Microsoft doesn’t have any other project that can reach these consumers.” Harlow believes that these cheap devices can serve as a bridge that brings new users into Microsoft’s ecosystem. The device is available in some colorful options, and is due for release this quarter. The company hasn’t confirmed which markets it will be sold in, but we’d expect it to surface in regions like Africa, Latin America, South Asia and Eastern Europe. Update 2: Microsoft says the device will “be available in select markets, including China, Egypt, India, Indonesia, Kenya, Nigeria, Pakistan, the Philippines and Vietnam”. We’ve reached out to Microsoft for further information about its plans for Series 30 devices, will update this post with any response that we’re given. In the meantime, if you’re curious about the Nokia 130, the video below will give you a rundown.